The simultaneous Oct. 1 shutdown of the federal government and launch of the health insurance exchange portion of the Affordable Care Act (also known as Obamacare) have become inextricably linked in the current partisan showdown in Washington. In recent days, two separate, but related conversations have taken place on Twitter—one about the government shutdown and the other about the ACA, the landmark legislation at the heart of the Congressional impasse that triggered the shutdown. Opinions about the shutdown in the run-up to the deadline were dominated by those opposed to it and who largely blamed Republicans. But there was more conversation on Twitter about the ACA than the shutdown in those three days, and views there were driven by opponents of the program and were largely critical of the president. The Pew Research Center analyzed about 600,000 tweets that directly referred to the government shutdown from September 27-30. The largest component of the conversation (35% of the assertions) was made up of tweets relaying straight news accounts and information without comment, while 26% focused on impact of a government shutdown, such as the effects on the stock market, federal employees or the economy as a whole. 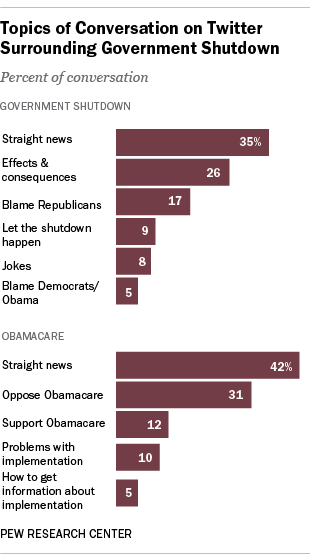 Almost a quarter of the conversation about the shutdown (23%) focused on who was to blame. And, by more than a 3:1 margin, the verdict was clear: In the discussion focused on finding fault, 77% of the assertions on Twitter blamed Republicans in Congress while 23% blamed Democrats in Congress or Obama. In the same time period, there was substantially more Twitter conversation (900,000 tweets) about the health care law than the shutdown. In this case, the single biggest component of that conversation (43%) involved expressions of support or opposition to Obamacare. Here, the verdict was almost the exact opposite of the shutdown sentiment. 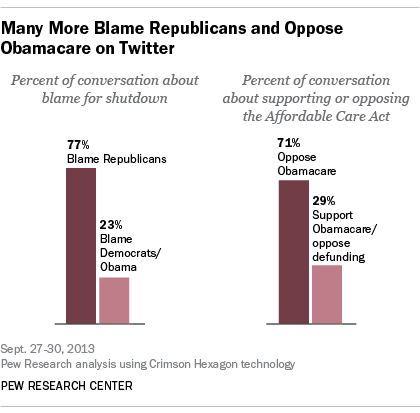 Of the Twitter conversation that included opinions, 71% opposed the health care law while 29% either supported the measure or opposed the Republican efforts to defund it. Note: You can see the methodology for this analysis here.